In their seminal research on coordination dynamics, Scott Kelso and his colleagues have developed an account of biological coordination in which the organization of action is viewed as a species of self-organizing pattern formation. Motor patterns are understood as a reflection of stability properties in a complex dynamical system, such as phase attraction and repulsion, bifurcation, and meta-stability. 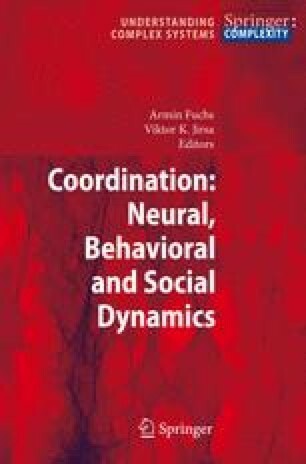 Moreover, the observation that similar coordination phenomena occur between visually coupled and neurally coupled oscillatory systems, from a swarm of Malaysian fireflies to the limbs of two people, led Scott to the view that coordination dynamics is fundamentally informational rather than physical in nature [29, 30].